Western Province Athletics (WPA) has announced that it will not take action against Muslim athletes who refuse to display the National Lotteries Commission (NLC) Lotto logo printed on Athletic South Africa (ASA) licences. Following complaints from a number of clubs, WPA has also labelled the issue involving licences and sponsors a “debacle”. According to the Holy Qur’an, gambling is the fourteenth Greater Sin, and the National Lottery is a form of gambling. The new 2017 licenses officially replaced the 2016 licenses yesterday. The 2016 sponsor was Old Mutual (OM), an international investment, savings, insurance, and banking group that sponsors a number of South African running events including the OM Two Oceans Marathon, the OM Soweto Marathon, and the Comrades Marathon. The 2017 sponsor is the NLC, which is the trustee of the National Lottery Distribution Fund (NLDTF) that benefits from all National Lottery (Lotto) payments. All South African sports bodies rely heavily on sponsorship. A percentage of Lotto proceeds are used to fund sports development and facilities, as well to increase accessibility to sports and recreation facilities for all. The NLC also has a strong partnership with the South African Sports Confederation and Olympic Committee (SASCOC) and Team South Africa, most recently injecting R70 million into helping to enable participation of athletes at the Olympic and Paralympic Games. As a result, the format and layout of ASA licenses (both temporary and permanent) would change for the 2017 athletics season. Provincial and sponsor logos are now printed at the top of licenses so that when race numbers are issued, these can be positioned below the provincial and sponsor logos. Specific race sponsors may display their name and logo under the race number. Muslim athletes competing in the Western Cape were outraged by the ruling that they must display the Lotto logo, preferring to defy the instruction and risk disqualification. Many covered the Lotto logo or folded the corner over so that it could not be seen. A competitor in the Cape Peninsula Half Marathon has covered the controversial Lotto logo that is in conflict with her religion. Allah pardons all the sinners in the month of Ramadhan except Three kinds of people: those who drink wine, those who gamble, and those who harbour enmity and avarice towards a Muslim. The Muslim population in South Africa is relatively small (about 1.59 million in 2014) but more than half live in the Western Cape. At the annual 27 For Freedom 27 km and 10 km races held in Wellington on February 11, announcements prior to the races warned that the logos at the top of new licences must not be covered and those ignoring or defying the instruction would be disqualified. The negative buzz amongst Muslim competitors was patent. On Friday, February 17 an elite veteran roadrunner, Youssef Kanouni, 43, featured in a local Cape Town tabloid newspaper, the Daily Voice. The paper caters primarily for working class communities and champions people’s issues. The article titled I won’t run with sin on my vest highlighted Muslim outrage. Kanouni accused WPA of intolerance and said he would not be threatened by the organization and would not compete until the issue was resolved. 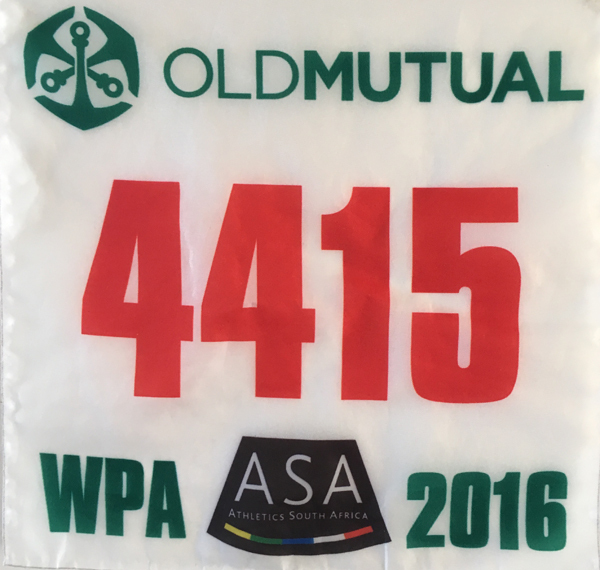 Yesterday, at the start of the Cape Peninsula Marathon and Half-Marathon, it was announced that WPA was standing by its Muslim members and anyone covering up the Lotto logo for religious reasons would not be disqualified. The announcement was greeted with loud cheering. The announcers said that affected WPA members must not take offence when officials asked for their names at the finish. Rather, it was important that ASA understood the gravity of the situation. No action would be taken against these people. Today, a letter to all WPA affiliated clubs dated February 18 was posted on the WPA website. WPA said it respected the rights of all members to act according to their convictions, and confirmed that the matter was being handled at “the highest level”. WPA president, Lester Cameron had been in contact with ASA president, Aleck Skhosana and a resolution was being sought as a matter of urgency. WPA has asked technical officials and members to act with “the utmost restraint” and decorum at all forthcoming events. The organization said it was resolute in finding an amicable solution. ASA sponsorship is not new to controversy. In 2009 Nedbank (part of the Old Mutual Group) pulled the plug on the annual Matha Series road running races a year earlier than agreed after the Caster Semenya gender controversy and general lack of delivery. In 2013 it was revealed that ASA was virtually bankrupt, with debts to its creditors far exceeding the R10 million it had in the bank. Creditors ranged from SARS to prizewinners from the Soweto Marathon. The stated solution was a bailout from the National Lottery. Previous: AB de Villiers Saving Himself for the Cricket World Cup – or What? No, Richard it doesn’t at all, and this is something that other people have highlighted on various FB pages. There is no indication yet what ASA plans to do. However, as far as I know only Muslims have objected.